Raising awareness is a proactive and productive dose of medicine. It can give us a real buzz, provide us with a sense of a purpose, and make a real difference at the same time. You don’t have to go to extreme lengths to raise awareness, simply sharing your story with a family member or taking leaflets to your local GP surgeries is all it can take to prevent someone else from contracting Lyme disease. Never fear that your efforts aren’t enough – every conversation you have about Lyme disease, every leaflet you share, every time you talk about Lyme on social media… it all helps raise awareness. Whether you tell a neighbour about tick bite prevention or hold a community fundraiser to pay for treatment, every person you arm with knowledge is someone you have helped to protect. That makes you a hero! 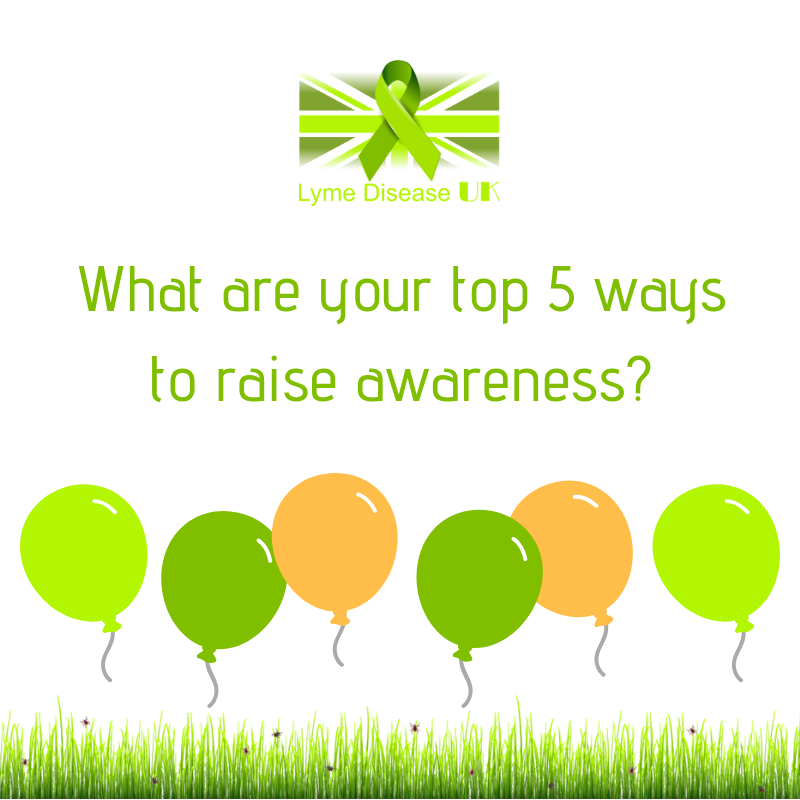 We asked the LDUK community: What are your top 5 ways to raise awareness? …and that they know what to do if bitten. Approach local MP to arrange a meet. Encouraging my local GPs to attend relevant conferences and events to learn more about the disease. We all have our own ways of contributing and bringing about change so just keep up the good work and remember what a difference you’re making! Run a sponsored event: walk, swim, run. The list is endless! No effort is ever too small, and it’s often the simplest things that work best. Just meeting with your MP or educating your doctor, could have a HUGE impact. We aim to protect and save lives whilst driving change so future generations won’t suffer from this awful disease. Hopefully they will be extremely grateful for our work in the here and now. I want to say a HUGE THANK YOU to all of you who are helping to bring about change. You should take great pride in your work and the change you are fighting for because we are writing the history books and you should be proud to be a part of it.